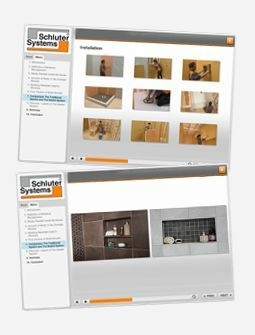 The first thing to do is plan out the installation according to the Schluter-DITRA Installation Handbook. The Handbook is available on our website for download or you can call Customer Support to request a print copy. The comprehensive Handbook features all the warranted DITRA details for ceramic and stone tile installation in both interior and exterior applications over various substrates, such as plywood, OSB, concrete, poured gypsum underlayment’s, and heated floors. Each application features a detailed illustration and provides direction on substrate preparation, appropriate setting and grouting materials, movement joints, etc.